Today I show you around Han market, one of the most popular market in Da Nang, Vietnam. Market shopping is a very Vietnamese tradition. In the market, you can find all kinds of fresh cooking, vegetable, clothes, shoes and other accessories. The price is cheaper than other places. 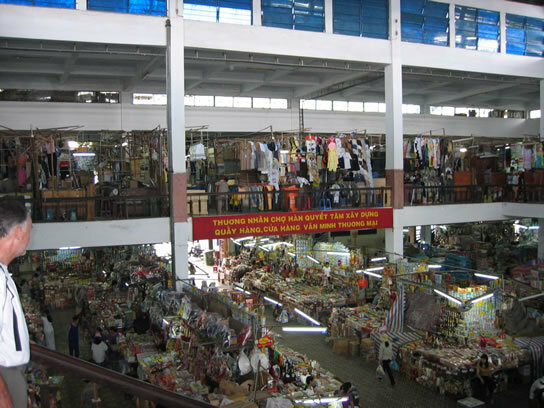 Therefore, Han market is a favourite market of local people and tourists in Da Nang because it has a variety of products. Basically, it is two-storey building, food on the first floor and clothing on the second floor. Now, let’s describe the first floor. On the first floor, you can find all kind of souvenirs in the main gate. Then move a little further inside, you can see two rows of stores selling sweet and dry food along your left and right side. Behind the sweet shop, you can find daily necessities, more food, rice and kitchen ware. Keep going, you will come to stores selling vegetable, herb, fish sauce, all the local sauces and pickle. In the final section of the first floor, you can find meat, fish, seafood, noodles, vegetarian and spices. Let’s move to the second floor where you can find clothes, shoes, cosmetics and other clothing stuffs. Outside the market, some people sell flower and fruits.